How we see colors: Our eyes are able to see the color that is reflected or scattered off an object. We cannot usually see the colors that are absorbed by an object. If all light reflects off an object, the object appears white. If all light is absorbed by an object, the object appears black. A red crab appears red because it reflects red light and absorbs all other colors. 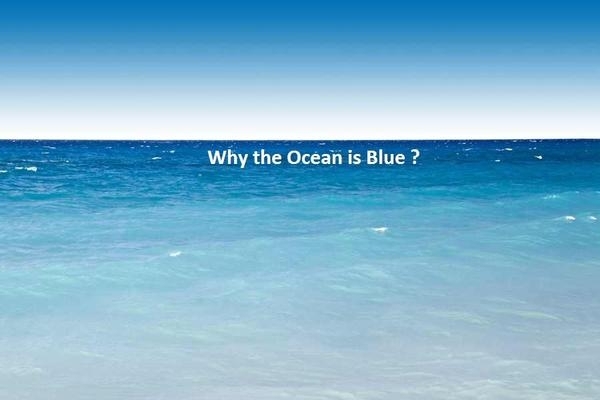 Now let’s see all the reasons and explanations of why the ocean looks blue in color. The ocean looks blue because it reflects the color of the sky. When light shines on the top of it, the water takes in all the wavelengths except for blue. The blue wavelengths are reflected, so we see the water as blue. When sunlight enters the ocean, it is absorbed or scattered by molecules and particles. The molecules and particles in water absorb red light first and then blue light. The ocean’s color is also dependent upon the color of the sky. On a day when the sky is bright the ocean appears blue, but on a cloudy day, it appears gray.